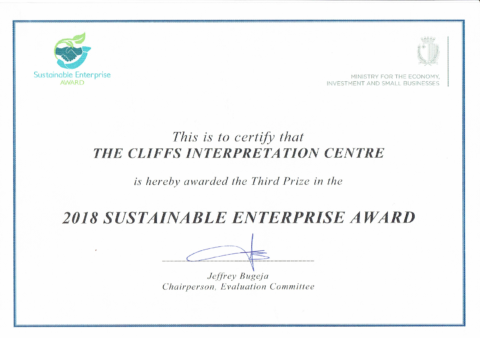 The Cliffs Interpretation Centre and La Pinta Ltd. which manages it, received five prestigious awards in 2018, related to the innovative and sustainable approach in amalgamating gastronomy with free information provision. At The Centre, we give part of what you give to the environment. When visitors dine at The Cliffs, they are supporting local produce and our innovative initiative to disseminate environmental education. In fact, a percentage of the bill is reprocessed by The Centre to create FREE informative activities. This way, the project is self-sufficient, and revenues from the catering facilities are used to provide visitors with the necessary free information, expertise and support resources to explore the area. Before Dingli Cliffs was designated part of the Natura 2000 network of protected sites, and even after, visitors (both locals and foreigners) were not aware of the natural environment and local produce offered in the area, and their main interest was the views. Hence, The Centre has sought to address the previous lack of services by blending the environment, tourism and local aspects whilst offering a service for visitors arriving at Dingli Cliffs. The Centre’s main aim is to provide the public with unique information about Dingli Cliffs and the surroundings using innovative means, and by doing so, reaching visitors more effectively. It introduced previously non-existent facilities for kilometres along Dingli Cliffs, including providing the only public toilets along the whole stretch of the cliffs. 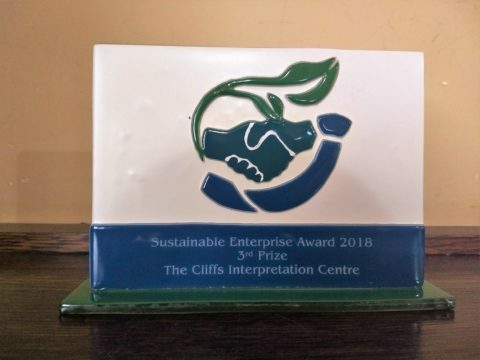 The Centre has received third prize in the 2018 Sustainable Enterprise Awards, organised annually by the Ministry for the Economy, Investment and Small Businesses. The aim of these awards is to recognise and reward businesses that have made a significant contribution to the varying aspects of sustainable development. The criteria upon which assessment included Proof of commitment, together with achieved results and long-term viability. The award enshrines the three main pillars constituting a sustainable enterprise – Economic sustainability, Environmental sustainability and Social sustainability. La Pinta Ltd, would like to thank the Dingli Local Council, for entrusting it with this project and for its on-going collaboration to ensure that Dingli Cliffs continues to be sustainably enjoyed by both tourists and locals alike. For more information, or to plan your next visit to the Dingli Cliffs and nearby attractions, visit www.thecliffs.com.mt or contact The Cliffs on [email protected].